This is a problem I always seem to get when installing any build (pre-release or RTM) of Windows 3.1 in either Virtual PC or 86Box. Whenever I choose "convert to NTFS", the file system conversion fails. Is there any fix to this? The file system conversion works just fine on Windows NT 3.5/3.51. The FAT partition should be FAT16 formatted. What's the size of the hard drive you're using? Not really what you were looking for, but if you set up a dual-boot configuration of NT 3.1 and NT 3.5 (installing the file system update from the NT 3.5 CD on NT 3.1), you can use NT 3.5's conversion utility to convert the boot partition to NTFS, then boot to NT 3.1 and ditch NT 3.5. It's not recommended due to file corruption issues. NT 3.1's disk code seems to contain timing loops that no longer work on modern hardware (and neither Virtual PC not 86box faithfully emulate hard drive speeds of the 90s). The size is 2GB (2048MB). Does MS-DOS 6.22 use FAT16? Yes, DOS 6.22 will use FAT16 for a drive of that size. Not sure why it wouldn't work, perhaps it's indeed related to timings as 3155ffGd said. 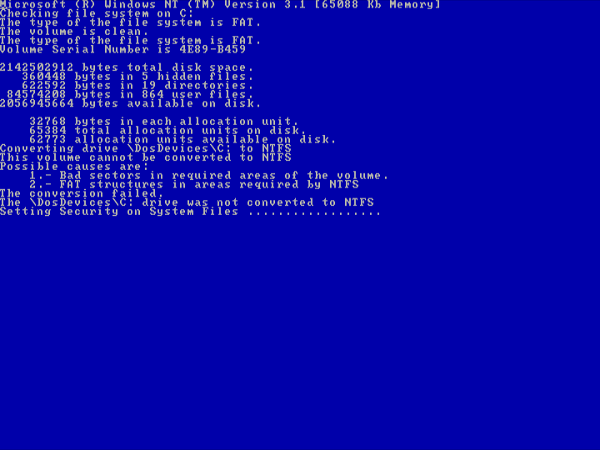 The NTFS conversion succeeds on NT 3.1 chk. It really does seem to be a timing issue. NT 3.1 wouldn't be the only operating system with such a bug (Windows 2000 RTM has a similar bug where it writes garbage to the hard drive if the hard drive is too fast).